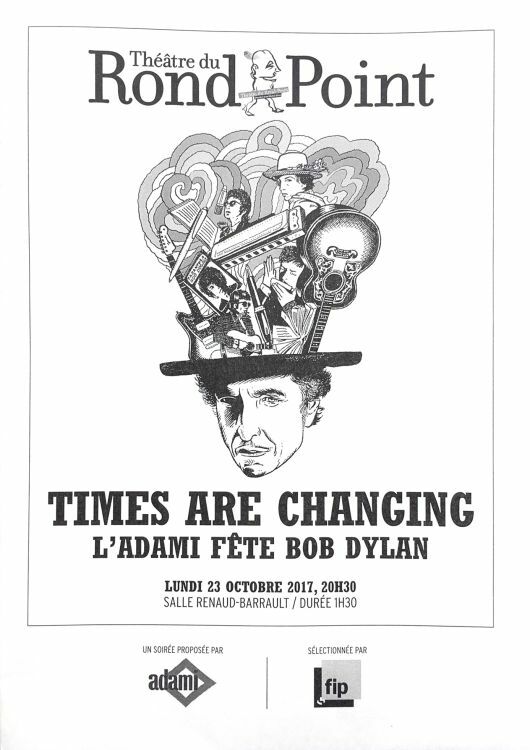 Flyer/poster for TIMES ARE CHANGING -L'ADAMI F�TE BOB DYLAN, musical performance by Jean-Claude Gallotta, played in Paris for two days only: 18 and 23 october 2017, at the Th��tre du Rond-Point. Very nice performance of dances on Bob Dylan music, Dylan texts reading, with Moriarty and the participation of the actor Jean-Pierre Kalfon. L'Adami, Maison des Artistes Interpr�tes, takes care of the rights of the artists. Thank you to Jean-Pierre Mercier for the information. 6 page A5 size document given away to every spectator, with information about Bob Dylan and the artists performing.